Participating in sports is generally thought of as a physically and emotionally healthy activity for children and teenagers. However, it is inevitable that children who play sports will at some point deal with disappointment. Not every play or game will go their way. While dealing with this disappointment can be difficult for children, it's also a great opportunity for growth. The excitement of the Super Bowl and other winter sporting events provide a chance to talk with your children about disappointment. 1. Acknowledge your child’s feelings about what happened. For example, you can say, “I understand that you are feeling really upset that you didn’t win the race.” Of course, this does not mean that you should agree with catastrophic statements that they might make, such as that they are the worst player that ever played or that their life is ruined because of a bad game. 2. It’s okay if kids don’t want to talk about a disappointing game or event immediately. You might simply acknowledge their feelings and tell them that you’re there for them to talk whenever they want to. 3. Help your children shift focus to what they did RIGHT on the playing field. This is especially important if your child is a perfectionist, in which case he or she is likely to focus on the one mistake rather than seeing the “big picture” of everything he or she has done right. 4. 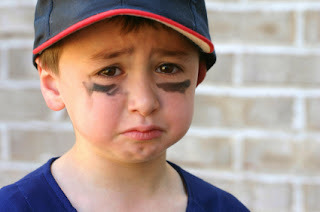 It’s certainly okay if your children’s disappointment leads them to want to improve their sports skills. Help them figure out exactly what skill they would like to improve, and then brainstorm ways to improve in that area. They might even ask for suggestions from the coach. Help your children set realistic goals and then give them praise as they work toward those goals. 5. Ask your children if they think their favorite athletes ever make mistakes in their sport. If these athletes said that they were terrible players and wanted to quit after one bad play or bad game, would your children agree with that? Of course not! 7. If a child is disappointed in his or her sporting performance, that is not an excuse for poor sportsmanship. It is not okay for them to express their disappointment as anger toward the winner. 8. Remind your children that failing to make a good play or to win a game does not mean that they’re a failure overall. There still are lots of great things about them, and everyone fails sometimes. Remind them of all the things they have done well recently.